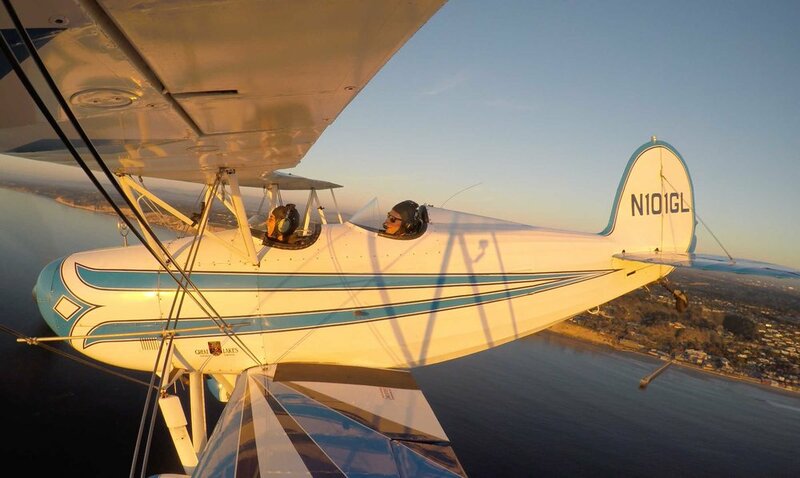 San Diego Sky Tours was lucky enough to fly with Aubry Marie on a Sunset Biplane tour. We have followed Aubry for a couple years on her amazing Instagram "AubryMarie," she is such a talented and inspiring woman! 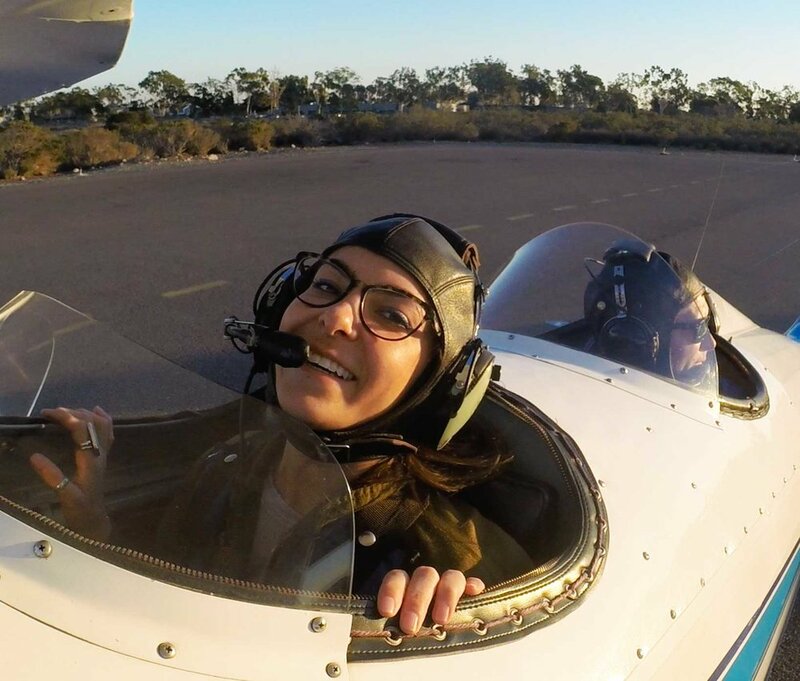 As pilots, we find a connection with her yoga spiritualism and aviation. We have many things in common, 'awareness' (pilots call it situational awareness), 'appreciation' of the beauty of the world (all about the view), and 'focus' required for piloting. San Diego Sky Tours is a 'band' of veteran pilots that enjoys getting people excited about aviation and creating a unique appreciation for our fine city. Please scroll down to see the pictures to share our experience with Aubry. 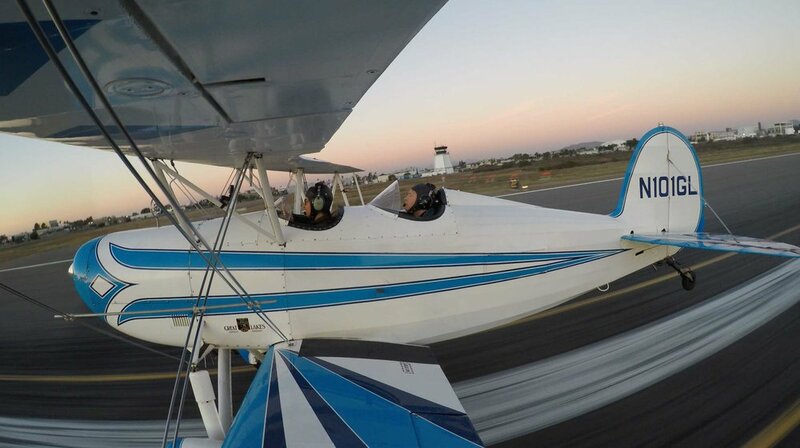 The Biplane Tour is more thrilling and less intimidating than you expect. Our open cockpit biplane tours are all FAA approved, our pilots are all extremely experienced. We are open 7 days a week for tours and you will depart from Montgomery Field. Believe it or not, winter can be the best time with our clear skies and smooth air. All our tour pilots are extremely EXPERIENCED as military pilots, airline pilots and long time flight instructors. Please check out our backgrounds. "We will be back in 30 mins! Enjoy a glass of wine and the sunset while you wait!" Bring all your friends and family to the Airport! 'You don't know what you don't know', I told Aubry, and promised this experience would be one of the best things you will do in San Diego. Aubry was a bit anxious, at first, but said she was comfortable because of my airline pilot and Navy Pilot background. Our Experience matters! Aubry made her way to Gibbs Flight Service and we met in the lounge. With all the airplanes around, it is exciting to walk out past all types of aircraft to our aviation themed hangar. First, don a flight suit, discuss some safety items with our pilots and climb into the biplane! Yes, it is as easy as that, no security lines or waiting! Aubry demonstrates how to easily climb in and get strapped in the biplane. She looks great in a vintage leather helmet and flight suit. Col. Pearl Wederbrook, USMC retired, flew in formation with another passenger this evening. We are very easy to schedule, our pilots are available every day of the year. Just call us! 619-757-6419. No sound until the end when Aubry gives her reactions to the flight. Getting in the Great Lakes Biplane is a snap! It just looks intimidating. A nice harness keeps you comfortable and safe in the open cockpit! We are awaiting our turn to Takeoff and coordinating with Tower Control. "Hang in there Aubry!" Awaiting Takeoff Clearance. At a private airport we only have to wait for a minute or so! A Takeoff on RWY 28R at Montgomery Field with Aubry's wingman next to her. Serious Acceleration pushes the Great Lakes Biplane into the air! Climbing out after takeoff. Aubry is looking at our Wingman Col Earl "the Pearl" Wederbrook just about 10 ft away on a perfect formation takeoff. Crossing the Beach at Crystal Pier and turning up the coast of La Jolla. Enjoying the San Diego sunset off shore Bird Rock. With La Jolla in the background, we are enjoying the prettiest of sunsets. 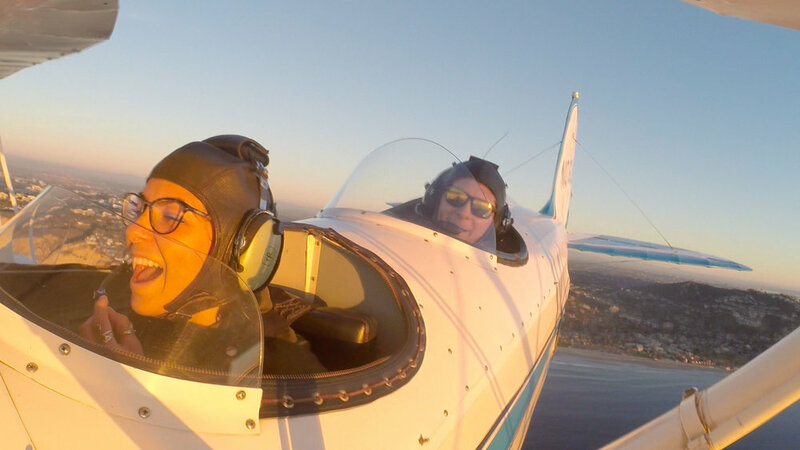 Aubry is flying next to La Jolla Cove, this is the best view in the house! Time to have some fun with steep turns and a little G's! "Pearl" is watching at a safe distance. I love the emotions on Aubry's face throughout the flight. She is remarkable, warm and aware. I was impressed! Starting a negative G pushover "Mav"! Now we have to "yank and bank" to the right! Aubry did a great job of hanging in there! Are we done yet? "Yes", you did great! Communication in the biplane is easy, with just a little wind noise. "Pearl" is crossing under our aircraft in a common Marine/Navy fighter pilot move. We are looking to land at Montgomery Field so "Pearl" is giving us some space with San Diego's Downtown in the background. Safe landing! Taxi back to parking. Sunset Mission Complete! Click on the picture below to see Aubry's reaction to the Experience.